Do you remember the song, “One of Us?” by Joan Osborne. In it she sang, “What if God was one of us; Just a slob like one of us; Just a stranger on the bus; Trying to make His way home?” I suppose we’d have to answer, “Whew that was close. I thought he was great. Guess he’s not great” (to borrow a phrase from the late Christopher Hitchens). Sarah Silverman is the latest “gone viral” actress/singer to reduce Jesus Christ to “just a slob like one of us.” Her video goal is to convince us that Jesus is “on her side” in the keep abortion legal, safe and prolific debate. Jesus appears to her one night and asks her to carry his message of love to the world. Then they just hang out, eat some popcorn and watch a marathon of NCIS episodes. (Jesus is played by NCIS actor Michael Weatherly). There’s nothing new here. Same old the liberal hash. 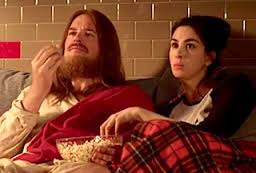 But what struck me is that the video is a fresh reminder that we live in a day, just like Jesus’ day in the first century when people want to domesticate him. Not that Sarah Silverman or Michael Weatherly seem to believe in him as the Savior. He’s just a political prop to jab at those of us who do. The box people wanted for Jesus then and today is a small one marked “Safe.” Just a slob like one of us. When Jesus ministered in Israel, he was the source of great consternation and division. People couldn’t figure him out and so were constantly trying to put him into one box or another. They built boxes labeled prophet, or miracle worker, or pretty good teacher, or at least a good man. Their boxes were much too small. Some even hinted (under their breath, of course) that he might just be the Messiah. But no one dared say it out loud because the consequences were just too costly (see John 12:42). Jesus resisted all efforts to being boxed. He wanted to be known for who he is at his core, namely the Son of God who was sent by the Father to do his will. Period. Jesus caused conflict and division then just as he does today. The human response is the same – tame him. As C. S. Lewis so famously said, he won’t be tamed because he is not safe. But he is good.